YSL Glossy gives you a gloss, stain and lipstick all in one so you can have it all. Capturing the revolutionary formula of the original, the Rebel Nudes also boast euphotic colored-light technology that gives your lips a scrumptious 3D effect. Highlight your lips with a lip plumper for a full look. Then, apply Glossy Stain to the bottom and top lip without blotting. Allow color to dry on lips for all-day shine. Repeat for a more dramatic glow. I missed out on swatches of two of the shades - 104 Fuchsia Tomboy and 105 Corail Hold Up. Will update with swatches in a bit. 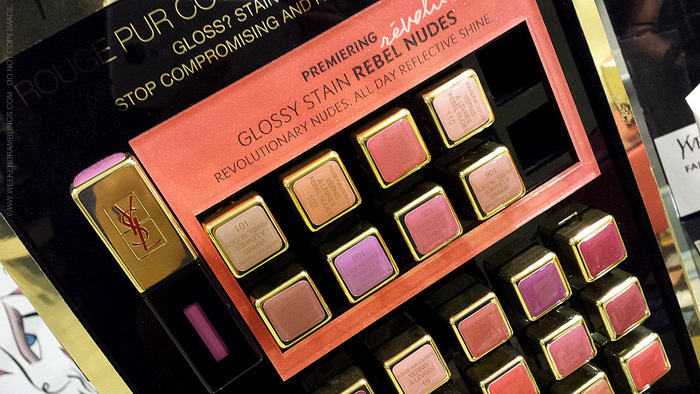 I haven't tried the YSL Glossy Stains (regular ones) so far, so I have no idea how these "rebel nudes" will be. The colors are interesting and quite true to the name - all lighter colors but definitely the usual safe neutrals. They aren't the sort of colors I normally wear, though, so I walked away with a happy wallet! Thanks for the swatches. Which of these gives the most obvious duo chrome? I saw a swatch of Fuchsia Fugitive that looks wicked cool. I'm trying not to go crazy, but I want them ALL!! I would think Reckless Pink. It looks a milky pink sorts, but there is a shimmer base to it that would give a duochrome finish, especially when topped over another lip color.